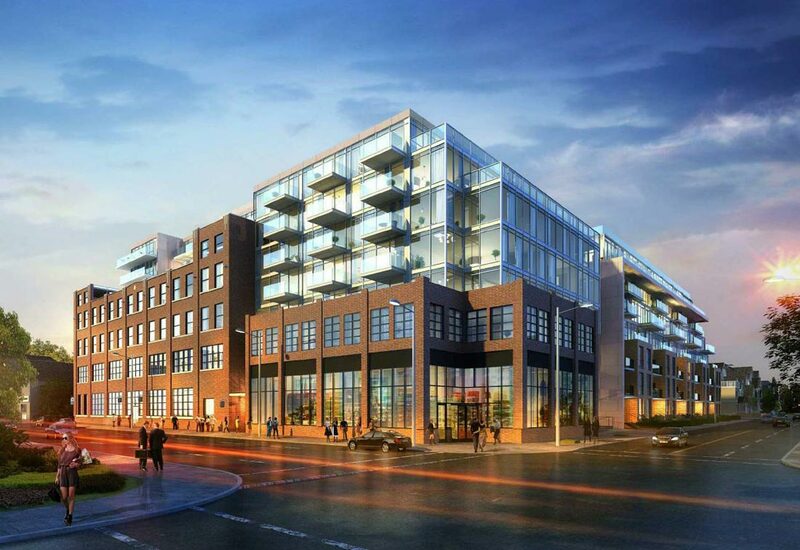 Located on Eastern Avenue, steps from the quaint shops and restaurants of Leslieville, 462 Eastern Avenue, will convert the former Weston Bread factory into a charming collection of authentic lofts, condos and townhomes. Wonder Condos which sits between two major intersections, Eastern Avenue and The Booth Avenue and is now in pre-construction phase, is by Graywood Developments and Alterra. It will be a 9-storey tower mixed use building housing 308 residential suites. It will comprise an assortment of studios (5 units), 193 one-bedroom units, 84 two-bedroom units, 26 three-bedroom units and townhouses. Wonder Condos anticipated date of occupancy is 2021. Near several parks including Hideway Park, Thompson Street Parkette and Jimmie Simpson Park. It will feature 13,000 sq. ft. of amenities, with 6630 sq. ft. of outdoor amenity access included. The building’s ground floor will also include a smaller area for indoor amenities plus some commercial space. It will also house an underground parking with 317 spaces, out of which 260 will be for the residents, 46 for visitors and 11 reserved for retail use. Wonder Condos location is walk-friendly with a Walk Score of 89/100. With a Transit Score of 96/100, it is also a rider’s paradise for students as well as working professionals travelling around the city for school or work. The project is a very short walk to the Queen St. streetcar and bus routes 501, 502, & 503, as well as the Carlaw Avenue bus routes 72 and 325. DVP and Gardiner Expressways are both located close by and motorists can opt to use either of them to get around. Leslieville neighbourhood in Toronto’s South Riverdale area is flanked by beautiful parks, charming streets, and a flourishing community. It offers exciting things to do as well as places to explore. The Toronto Beaches area is located just east of the Wonder Condos. It features boardwalks and quiet shops along Queen St East. This is a great location for either a walk or bike ride. Nearby, to the south of the development is the Cherry plus the Tommy Thompson Area and Bird Sanctuary. Christened the “brunch capital” of Toronto, Leslieville is among the city’s most coveted neighbourhoods offering stress-free access to downtown, the waterfront, plus an array of local eating and shopping options. The location is popular with families – thanks to the many parks, schools and community centers in the area. It is home to many excellent choices for local schools. It is also popular with professionals. Urban explorers will be happy being very close to other classy neighbourhoods like the Distillery District or the Beaches. Wonder Condos is also ideal for students studying at George Brown College, Ryerson University, University of Toronto, as well as OCAD University. Graywood Developments is a private investment firm specializing in real estate development, with a selective but imposing portfolio ranging from glossy skyscrapers to contemporary boutique buildings. They have built some innovative urban condos in Toronto recently, thereby making a name for themselves. Alterra is an award-winning developer boasting of 40 solid years of experience in the Greater Toronto Area.